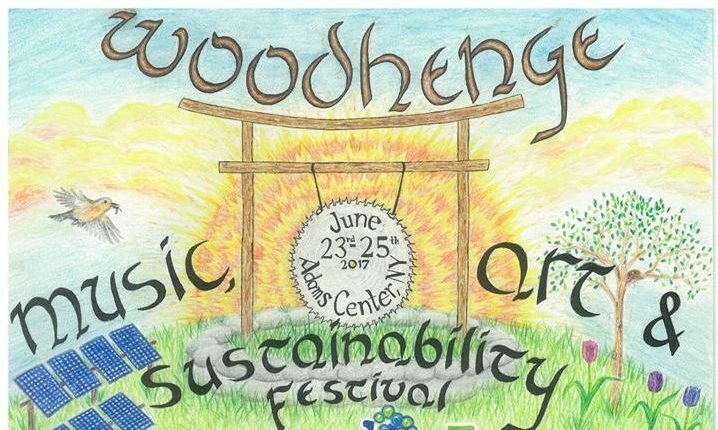 Off the grid sustainable community, Woodhenge, has announced its first Woodhenge Music, Art, and Sustainability Festival. Located in Adams Center near the Adirondacks, the community will host the festival on June 23-25. The three day event features a diverse mix of music genres including rock, jam, jazz, reggae, bluegrass, electronic, and funk, and features over 20 artist including Formula 5, Space Carnival, Root Shock, Intrepid Travelers, Lord Electro, Jiggawaltz and Drumadics. Fans will have the privilege to explore each morning the 60+ acres of nature and trails the area has to offer, along with yoga and workshops focused on how to live mortgage free, creating a sustainable lifestyle, optimal nutrition, and how to build with recycled materials. The event itself will be held in a field, between the village’s garden and orchard. In 1997, James and Krista Juczak, created the eco/self reliance village known as Woodhenge. The mortgage free community is set in the foothills of the Adirondack Mountains along the outskirts of a large forest, complete with a stream and waterfall set between a pond and an orchard. The off the grid solar and wind powered sustainable community practices upcycling, using environmentally friendly materials along with alternative building techniques. The village grows and cans most of their own fruits, berries, nuts and vegetables in their community garden and raises their own ducks and honey bees for honey and eggs. The community also hosts several workshops throughout the year on building a tiny house, living off the grid, and renewable energy. Known as the “King of Scrounge,” Juczak took 5 years to build his 3000 square foot home, set on 50 acres, out of recycled material including beams salvaged from an old bowling alley, and a two-story concrete column made out of scrapped manholes. Windows, doors, sinks, tubs, and other items were bought cheap, or salvaged for free from renovated buildings. The mortar holding the walls is made from 80% paper sludge waste from a nearby mill. The other 20% is made of masonry cement. Juczak has also buried a 10,000 gallon fuel tank used as a guest home buried into the side of a hill. Woodhenge has also hosted other music festivals in the past including Summer Solstice Campout in 2016, and the Halloween Costume Fiesta. Fans who purchase full weekend passes to the festival online will save some cash. The online pass costs $50 for all three days, and $60 at the gate on Friday, June 23. Other passes range between $20-$40. Camping is available in the field, and in the forest close by.